You will earn 4,603 Reward Points. Earn 1 reward point for every 1 dollar spent. 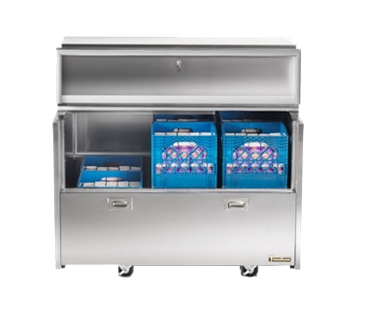 Spec-Line Forced-Air Double Access Milk Cooler, sliding door, holds (8) 13"x13" crates or (4) 13"x19" milk crates, stainless steel interior and exterior, reinforced floor, sliding caster rails , (2) heavy-duty stainless steel dunnage racks, top-mount refrigeration system, Santoprene® E-Z clean gaskets, floor drain, 4" casters, 1/3 hp, UL, NSF.